Von Mechel was an old publishing house in Basel, Switzerland, which was apparently the only printing office willing to publish whatever the Swiss Mennonites of the late 17th and 18th centuries wanted published. It is well known that this period around the turn of the 17th century was one of harsh persecution by Swiss authorities (mainly in Bern), a time when large-scale emigration to Alsace andthe Palatinate took place. And yet, a number of books, tracts, hymns, and prayers were published, to be sure without any indication as to place, year, and author, which soon became standard devotional material of the Brethren. Careful study of all evidence makes it certain that it was this Mechel publishing house where Mennonites found a willing support, not only at the time of the establishment of the firm in 1685, but all through the following centuries, the last publication known from this house being the Ausbund of 1838. The history of the Mechel house has never been fully studied. The founder of the firm was Johann Conrad von Mechel (1642-1715), who after having been an itinerant journeyman in his trade all over Europe, married in 1681 a daughter of the well-known Basel printer family of J. J. Decker, and opened his own shop in 1685. Since the Deckers had bought the still older Basel printing office of Henricpetri (16th and 17th century), it is not surprising to find woodcuts and colophons of the Henricpetri era on Mechel productions. The elder Johann Conrad was succeeded by his son of the same name (called Hans Conrad, 1681-1734). After the latter's death the firm was continued by his widow Anna Maria, nee Christ, and her twin sons Johann Conrad and Johann Jakob (born 1730), the "Gebrüder Mechel." The last name of interest to us is Jakob Heinrich von Mechel, active 1830-1840. No one has ever noticed the close ties between this press and the Swiss Mennonites which, however, were quite apparent. An advertising list at the end of the 1822 Mechel edition of the Dordrecht Confession of Faith contained nine Swiss Mennonite books and ten other books much in demand by the Brethren. 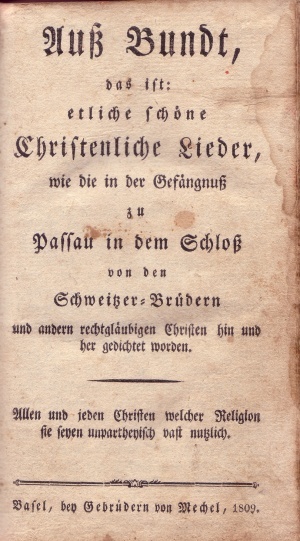 The Mennonite books were as follows: Ausbund, 1809 (earlier editions seem to have come from the same place); Ernsthafte Christenpflicht, 1796; Güldene Aepffel, 1742 (and also 1702); Schabalie, Die Wandelnde Seele, 1811 (and before 1770); Kleines Handbüchlein, etc., 1801; Glaubensbekenntnis, 1822 (and earlier 1742); D. Philips, Enchiridion, 1822; Ein Sendbrief (about 1720); and G. Roosen, Unschuld und Gegenbericht, 1753. It is most likely that Das Gebätt by Hans Reist (around 1700) was also printed here, as well as earlier editions of the Ausbund (1695 or 1699). A Namenbüchlein (see A-B-C-Books) of 1740 was much in use by the Mennonites. Also popular were other Mechel publications such as the Geistliches Lustgärtlein, 1815; Joh. Arndt's Paradiesgärtlein, 1737; Abschied der zwölf Patriarchen, 1744; Sieben Busspsalme, etc., 1751; and Thomas à Kempis (in Teersteegen's translation), 1752 (Friedmann, 98). It is remarkable that in 1822 books more than a century old were still advertised to Swiss Mennonite readers. L: Ausbund of 1792; R. Ausbund of 1809 MAO photographs. A special feature of this publishing firm was its hymn prints. It not only printed official (Reformed) hymnals but also the Ausbund. The 1809 and 1838 editions bore the firm's name, but there was evidence that already around 1695-1699 one or two Ausbundeditions must have been produced by this press, and most likely one or several 18th-century printings as well (Friedmann, 170 f.). Besides this most important Mennonite hymnal a number of Anabaptist hymn-pamphlets and pamphlet collections were printed here, recognizable by their characteristic colophons' and inscriptions on the title page. One Ausbundappeared bound or printed with (same size, same type) Fünf schöne neue geistliche Lieder, 1695 (among them also the Thessalonica hymn), in 1696 followed by the Neuaufgerichtetes geistliches Liederbüchlein(Neff, MQRIV, 1930, 208), and in 1699 by 20 neue geistliche Lieder, with an appendix Drey Geistliche Lieder(Wolkan, Lieder, 157 ff.). 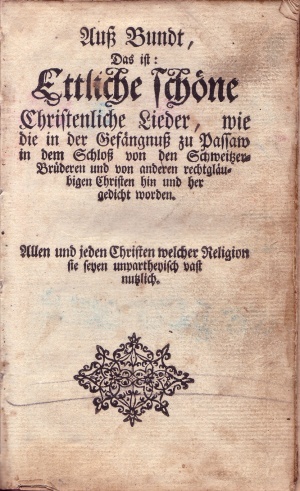 The same Drey Geistliche Lieder, 1699, were also found in the rare volume which contained the oldest (1564) edition of the Ausbund. Here they were bound together under one cover. In 1708 another collection of hymns "gedruckt zu Basel" appeared (Neff), and so on. Their Mechel origin is fairly certain. Most remarkable was one volume (at Mennonite Historical Library, Goshen, Indiana, USA) containing not less than 96 such hymn pamphlets (with 310 hymns) covering the period from 1709 to 1803 or even later, all of the same size. Among them were found the Haslibacher Lied, the Reist-Lied, "Es ist eine wunderschöne Gab," even one hymn from the oldest Ausbundedition, "Wach auf, wach auf," which may be as old as 1540. Death's head colophon in Güldene Aepffel (1742) MAO photo.There can be no doubt that all these books and pamphlets came from the same press. Two of these books showed the same colophon, a circle of 13 death's heads with the circumscription: pope/emperor/king/prince/count/baron/noble/commoner /peasant/rich/poor/old/young. In the center stood the verse from Jesus Sirach, "Mensch du musst sterben" (Ecclesiastes 14:18; see Friedmann, 157 f., and plate III). This emblem was contained in Güldene Aepffel(1702, 1742) and the Sendbrief(1720), both still advertised in 1822. Likewise the inscription "Gedruckt im Jahr da wahre Buss von Nöten war" appeared more than once on the title page (Neff and Friedmann, pl. III); since these books were advertised by Mechel in 1822, one may safely assume their origin at this press. Many of these books and pamphlets bore on their title page woodcuts, some of the early 16th century (once the Henricpetri colophon was used), all of which indicated a fairly uniform publishing policy. This policy was all the more remarkable since it did not conform to the leading style of the period (baroque) but rather used and re-used Renaissance or even pre-Renaissance cuts, apparently inherited from the Henricpetri office. 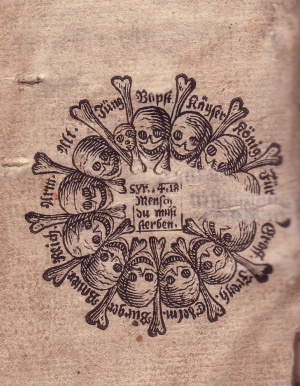 Only the death's heads circle was contemporary (around 1700) but it fit very well with the spirit of the reprint of the old Basel Totentanz (originating as far back as 1451) in 1715. A characteristic specimen of the Mechel prints was the Namenbüchlein of 1740 (Bey Johann Conrad von Mechel sel. Wittib) with a woodcut (a family praying before meal), decidedly of early 16th-century origin (Friedmann, plate V; original at Mennonite Historical Library, Goshen, Indiana, USA). With the Ausbund edition of 1838, the connection between the Swiss Mennonite and Amish groups (in Alsace and the Palatinate) and the Mechel publishing house seemed to come to an end. Much gratitude is due to Mechel, for without its readiness to print all these books the literary history of the Swiss Mennonites would have been much poorer. Friedmann, R. Mennonite Piety Through the Centuries. Goshen, 1949. Here the relationship between Mennonites and the Mechels is studied for the first time. Neff, Christian. "A Hymn of the Swiss Brethren." Mennonite Quarterly Review 4 (1930): 208 ff. Personal information from the University Library of Basel and the Oeffentliche Basler Denkmalpflege. Wernle, Paul. Geschichte des Schweizerischen Protestantismus im 18 Jahrhundert I: Verniinftige Orthodoxie und Pietismus. Tubingen, 1923. Friedmann, Robert. "Mechel, Von (Publishing House)." Global Anabaptist Mennonite Encyclopedia Online. 1957. Web. 22 Apr 2019. http://gameo.org/index.php?title=Mechel,_Von_(Publishing_House)&oldid=143649. Friedmann, Robert. (1957). Mechel, Von (Publishing House). Global Anabaptist Mennonite Encyclopedia Online. Retrieved 22 April 2019, from http://gameo.org/index.php?title=Mechel,_Von_(Publishing_House)&oldid=143649. Adapted by permission of Herald Press, Harrisonburg, Virginia, from Mennonite Encyclopedia, Vol. 3, pp. 547-549. All rights reserved.